Four Sevens Santa Cruz 52 LLC began in 2007 with the Purchase of a 1993 Santa Cruz 52. The idea was to give people an opportunity to race high end off shore regattas while offsetting the operating cost that goes with maintaining and owning a race boat. 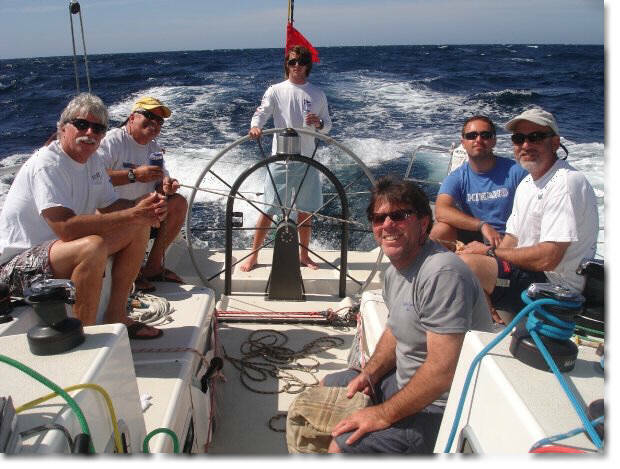 The boat immediately filled a schedule of offshore racing such as Newport to Cabo, Transpac, and San Diego to PV/Mexorc along with some inshore racing as well. The boat was originally built for the Chandler family in the early 90’s and named Pressure Cooker. It was specially build to have a carbon fiber deck and partial carbon hull. Some of the structural components are carbon as well making it the lightest Santa Cruz 52 built. The boat campaigned for multiple years until the second owner purchased the boat and outfitted it for cruising. The boat’s alternate interior is a plush teak and holley, suede navy blue upholstery, and bright white paint. The boat was also equipped with electric push button winches, roller furling spectra headsail, socked asymmetrical spinnaker, full batten spectra mainsail, microwave, and full sound system. In an effort to increase the performance, everything that wasn’t absolutely necessary was stripped out of the boat. Carbon fiber floor boards replaced the teak and holley, alternate lightweight upholstery replaced the suede, the stereo, microwave, oven, and table were all removed and stored in bubble wrap offsite. The electric winches were replaced with three speed race winches. Even the fiberglass/teak staircase was replaced with a lightweight aluminum version. Unfortunately in 2009, the rig broke in the Long Beach Harbor entrance and was unrecoverable. Relentless was then equipped with a brand new OFFSHORE SPARS mast and outfitted by SeaTek in Wilmington. New sailed were built out of Ullman Sails Newport Beach. The boat sat rig-less for 8 months and missed a large section of the racing calendar. Since then, the boat has participated in multiple Transpacs and Mexican races, the latest being 2015. It also has sailed in multiple coastal races up and down the coast with great results. Relentless can also be seen on NCSI television show, occasionally being used by the film industry in various scenes.